Sultan-ul-Arifeen Sultan Bahoo was born on Thursday, 1st Jumada ath-thani 1039 H (17th January, 1630 AD) in Shorkot, District Jhung, Pakistan (then India). It was the reign of Mughal emperor Shah Jahan. Sultan Bahoo belonged to the Awan tribe whose genealogy traces back to Ali ibn Abi Talib. Awans are the progeny of Ali ibn Abi Talib from wives other than Fatimah bint Mohammad. Meaning: Bahoo’s mother named him Bahoo because he has always remained with Hoo (ھو). Undoubtedly, Sultan Bahoo was a Saint by birth. Hence he remained engrossed in heavenly experiences and revelations from his early age. Surprisingly, a non-Muslim would immediately accept Islam if his eyes fell upon the luminous face of Sultan Bahoo. Such was the intensity of Divine theophanies radiating from him. Explanation: Although, I did not get any worldly education but the esoteric knowledge has completely sanctified me. Sultan Bahoo states in his books, “I searched for a spiritual guide for thirty years but in vain”. It was mainly because he already held such elevated levels of Faqr where access of anyone is extremely arduous. Though, Sultan Bahoo relates a revelation in his books about his oath of allegiance to the Holy Prophet. One day, engrossed in Allah’s vision, he was wandering in the suburbs of Shorkot. All of a sudden, Ali ibn Abi Talib came and took him to the Mohammadan Assembly. In the assembly, the People of Cloak, the Rashidun Caliphs and Shaikh Abdul Qadir Jilani were also present. There, Sultan Bahoo took oath of allegiance at the sacred hand of Prophet Mohammad. Then the Prophet entrusted him to Shaikh Abdul Qadir Jilani for further spiritual guidance. That is why Sultan Bahoo always refers Shaikh Abdul Qadir Jilani as his spiritual guide in his books. 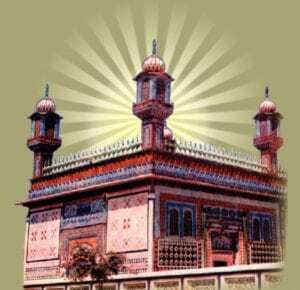 He says, “When Shaikh Abdul Qadir Jilani blessed me, I surpassed all spiritual levels from eternal beginning till eternal end.” Afterwards, following his orders, Sultan Bahoo took oath of allegiance at the hand of Shaikh Abdul Rehman Jilani Dehlvi. He lived in India and was the Shaikh of Sarwari Qadri order and possessor of Divine Trust before Sultan Bahoo. It is important to realize that he entrusted the Divine Trust of Faqr to Sultan Bahoo in just a single meeting. Title of Sultan Bahoo is Sultan-ul-Arifeen meaning ‘the king of Mystics’. He holds the status of fifth Sultan ul Faqr. Though, Sultan Bahoo could not read or write, even then he has authored 140 books. Whatever he stated verbally as a result of Divine revelations, his spiritual successors wrote it there and then. All his books are in Persian except the collection of his poetry which is in the form of Punjabi quatrains. Undoubtedly, Sultan Bahoo’s books are masterpieces of the Divine knowledge. He proclaims that his books are a medium to reach the perfect Sarwari Qadri spiritual guide. Moreover, if any seeker has demoted spiritually, he can regain his status through his treatise Risala Roohi Sharif. Specifically, his writings are so persuasive and influential that they envelop the reader completely. If a seeker reads his books respectfully after ablution, certainly an ocean of spiritual beneficence pours down to him. Abyat-e-Bahoo (Punjabi poetry) (2) Divan-e-Bahoo (Persian poetry) (3) Ain-ul-Faqr (4) Majalisa-tul-Nabi (5) Kaleed-ul-Tauheed (Kalan) (6) Kaleed-ul-Tauheed (Khurd) (7) Shams-ul-Arifeen (8) Ameer-ul-Kaunain (9) Taigh-e-Barhana (10) Risala Roohi Sharif (11) Ganj-ul-Asrar (12) Mehak-ul-Faqr (Khurd) (13) Mehak-ul-Faqr (Kalan) (14) Asrar-e-Qadri (15) Aurang Shahi (16) Jamay-ul-Asrar (17) Aqal-e-Baydar (18) Fazal-ul-Laqa (Khurd) (19) Fazal-ul-Laqa (Kalan) (20) Miftah-ul-Arifeen (21) Nur-ul-Huda (Khurd) (22) Nur-ul-Huda (Kalan) (23) Taufeeq-ul-Hidayat (24) Qurb-e-Deedar (25) Ain-ul-Arifeen (26) Kaleed-e-Jannat (27) Mohkim-ul-Fuqara (28) Sultan-ul-Waham (29) Deedar Bakhsh (30) Kashf-ul-Asrar (31) Mohabbat-ul-Asrar (32) Tarfa-tul-Ain (this book is also known as Hujjat-ul-Asrar). Further translations of his books are in the pipeline. Sultan Bahoo has not used the conventional terms of sufism or mysticism for his teachings, rather he calls them Faqr. In essence, Faqr is the spiritual way which leads to the Divine knowledge and vision of Allah. In all his books, he particularly lays emphasis on acquiring Faqr under the guidance of a Sarwari Qadri spiritual guide. Moreover, he declares the invocation and contemplation of Ism-e-Allah Zaat the key to sanctity of innerself and purgation of soul. Subsequently, the purged soul attains vision of Allah and presence in the Mohammadan Assembly, the most elevated spiritual stations. In order to achieve them he strictly persuades the seekers to renounce love of world and paradise. Furthermore, he teaches to abstain from the desires of innerself and seek only Allah with pure intention. Also, the seeker must get rid of spiritual diseases like arrogance, malice, conceit, backbiting, miserliness, hypocrisy, pretense etc. For all these purposes, Sultan Bahoo declares the guidance of true Sarwari Qadri spiritual guide inevitable. He also clearly mentions the signs of true spiritual guide and fake guides so that the seekers are not deceived. طالب بیا! طالب بیا! طالب بیا! Explanation: Whoever came to me wanted to fulfill his worldly desires. No one deserved to be my spiritual confidant whom I could transfer the Trust of Faqr. Hence, he left this world without transferring the Trust. Eighty four years after death of Sultan Bahoo, Sayyid Abdullah Shah Madni Jilani was born in Madina in 1186 Hijri. He was eternally chosen to be entrusted the treasure of Faqr. Thus, he came from Madina to India at order of Holy Prophet and under guidance of Shaikh Abdul Qadir Jilani. It was the year 1241 Hijri (1825 AD). Thereupon, Sultan Bahoo finally transferred him the Divine Trust of Faqr from his shrine. Then Sarwari Qadri order continued from Sayyid Abdullah Shah Madni Jilani. His first wife belonged to the family of Makhdoom Burhanuddin Ahmad, resident of Langar Makhdoom, district Jhang, Pakistan. Second wife was also from Awan tribe. Third wife was his close relative. Fourth wife belonged to a rich Hindu family. She accepted Islam at the hands of Sultan Bahoo before he married her. Doctor Sultan Altaf Ali writes in Mirat-e-Sultani (Bahoo Nama Kamil) that he also had a daughter. Her name was Mai Rehmat Khatoon. Sultan Bahoo’s family continued only from his three sons; Sultan Noor Mohammad, Sultan Wali Mohammad and Sultan Latif Mohammad. While, other sons died childless. One of his sons, Sultan Hayat Mohammad died in childhood. Sultan Bahoo died at age of sixty three years on Thursday, 1st Jumada ath-thani, 1102 Hijri (1st March 1691 AD). 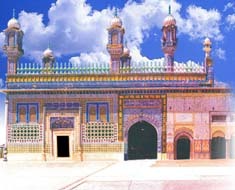 Shrine of Sultan Bahoo is in Garh Maharaja, tehsil Ahmadpur Sial, district Jhang, Pakistan. This shrine is free from all kinds of heretical practices. Here, hundreds of Mystics remain in seclusion for the sake of vision of Allah. Once entered in the shrine, one does not want to come out of it. Especially, the seekers of Divine Truth never return empty handed from this shrine. The death anniversary of Sultan Bahoo is celebrated every year on the first Thursday of Jumada ath-thani. People come from far off places to join the celebrations.